The character building program called EarlyAct FirstKnight had its formation here in District 5840 in 2005, with its first successful launch sponsored by the Rotary Club of Boerne. EAFK is now sweeping across our district, Texas, and the United States with dynamic results both in improved discipline and higher academic learning for our children. Unique in the field of character education, EAFK teaches high ethical standards, service and Rotary International lessons to the entire student body every day, right alongside core academic subjects like math, science and social studies. Unlike a traditional InterAct or EarlyAct Club, EAFK is a mandatory course of study for every child with uniquely integrated components such as classroom curriculum, Rotarian-led service opportunities, award assemblies, elaborate live-action premium options, and parent education. In EAFK schools, the Four Way Test is recited daily by the student body from memory; students start learning about Paul Harris in 3rd grade; and 5th graders will have the latest news about Polio Plus. The word, "knight" means "servant", and EAFK brings the values of noble character and service alive for children through the spectacular theme of gallant heroes and chivalry. Students in EAFK schools walk campus hallways decked out like castles; learn wisdom from "The Code" curriculum; win awards for noble service; earn rankings toward knighthood in regular school-wide ceremonies; benefit from on-site Rotarian mentorship and work together on local and global service projects. 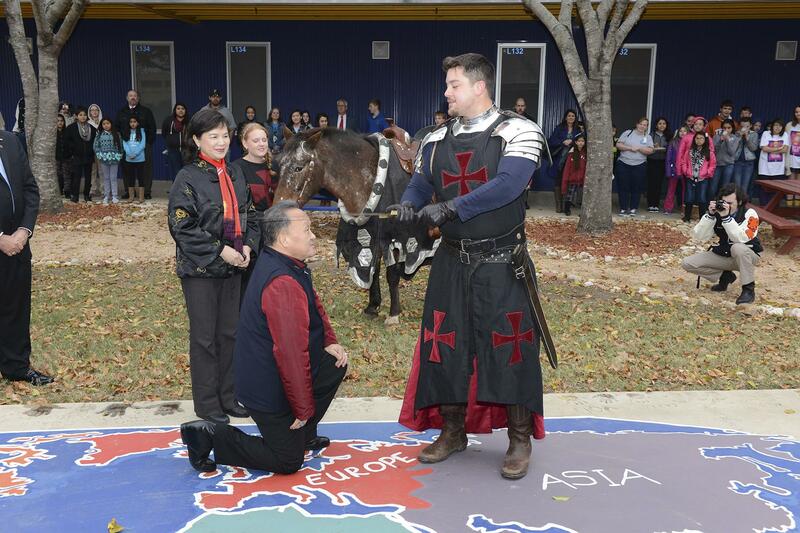 EAFK schools also get visits from real armored knights and live warhorses on campus! There is nothing like EAFK anywhere in the world and the program is available exclusively for Rotary Clubs to use in their communities. To learn more about EarlyAct First Knight, visit www.eafk.org . To learn more about the developers, visit www.randallparr.com. In order for EarlyAct FirstKnight to work and see these tremendous results, the school faculty, as well as the sponsoring Rotary club, must believe in the program 100% and give it their full attention and support. The students not only learn how to make right choices, but they learn the meaning and application of Service above Self. Many of the students who get recognized each six weeks are not necessarily the leaders of the class, or even the best academic performers. Many of them are honored for the first time in their lives through EAFK at their schools, and recognize that it is “cool to be caught being good”. The program teaches the students ethics and the Four Way Test of Rotary, while exposing them to the chivalry practiced by heroes of history. There is also a service club component to the program that we hope will lead these elementary school children into Rotary Interact when they move into their middle and high schools and become Rotarians later in life. If your club is interested in sponsoring EAFK at a school in your area, please contact D5840 Chair, Scott Ratcliff, by email at: ratcliffeng@gmail.com , or go to www.eafk.org to get more information. Also, if you are interested in partnering with another Rotary club in your area to share the responsibilities and funding an EAFK program, please contact Scott. EAFK changes Communities, Families, and Kids through service! Students from these EAFK clubs have taking the Rotary motto “Service above Self” to new heights as they serve their respective communities by participating in honor parades, by feeding the hungry through raising awareness and collecting food items for local food pantries, by supporting world-wide education through such programs as Hope for Senegal, by providing humanitarian aid, and raising funds for the fight against polio and leukemia. A special thanks to the Georgetown Rotarians for perparing this video.